Buzzfeed captured President Obama with a selfie stick, a gif they promoted with the online site’s sit-down interview with him. Obama’s embrace of online news and social media continues a long tradition of presidents employing the latest communications technologies to speak to Americans directly rather than through the Washington press corps. 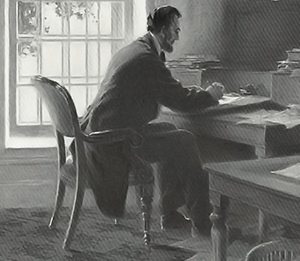 In honor of Presidents Day, and given our abiding interest in all things tech, here’s a rundown of how presidents have adopted and used the “new media” of their eras. WILLIAM MCKINLEY: McKinley’s presidential campaign produced the first campaign film: a short, silent re-enactment of McKinley receiving word of his nomination, released in September 1896. McKinley’s inauguration the following March was the first to be filmed; he appeared on film several more times during his presidency, right up to the Pan-American Exposition in September 1901 where he was assassinated. 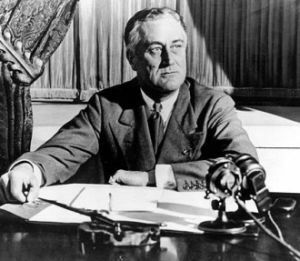 FRANKLIN ROOSEVELT: FDR was generally acknowledged as a master at communicating over the radio, using it to speak directly to the American people in his “fireside chats.” Roosevelt had broadcasting equipment permanently moved into the White House, and he was the first president to appear on television, in a special broadcast from the 1939 World’s Fair (though he was only seen on a handful of TV sets in New York). DWIGHT EISENHOWER: Although Harry Truman’s 1949 inauguration was the first to be televised, Eisenhower proved to be the first real television president. His 1952 campaign introduced TV ads; on Jan. 19, 1955 he held the first presidential press conference to be covered by television as well as by radio and motion-picture newsreels; and in 1958 Eisenhower became the first president to appear on color TV. BILL CLINTON: As the Democratic nominee in June 1992, Clinton famously played his saxophone on The Arsenio Hall Show; as president in April 1994, he even more famously went on MTV’s Rock the Vote and answered a young woman’s question about whether he wore boxers or briefs.